HomeGIS CareerGIS Manager Job: Do You Want to Manage Some Very Spatial People? GIS Manager Job: Do You Want to Manage Some Very Spatial People? What Does a GIS Manager do? How Much Money Does a GIS Manager Make? GIS managers don’t necessarily need strong technical skills in GIS. It’s a big plus if they do. But they don’t have to. With their main focus on managing budgets, employees and business development, GIS managers need good organizational skills with solid public speaking skills. Your days will be booked with a lot of these. For example, this icludes spreadsheets, email, phone calls and meetings. GIS managers often are project and departmental managers taking on several other roles. 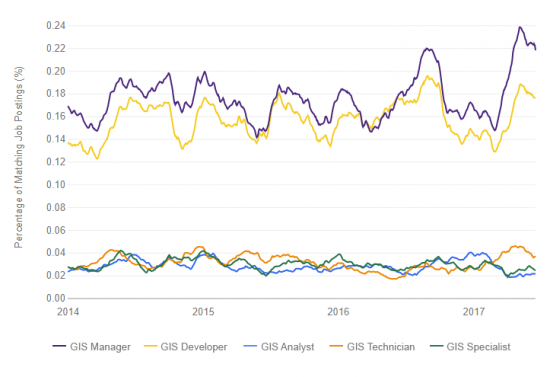 According to Indeed job trends, GIS managers are one of the highest in demand. But what types of skills do you need to become a GIS manager? What is the average GIS manager salary? 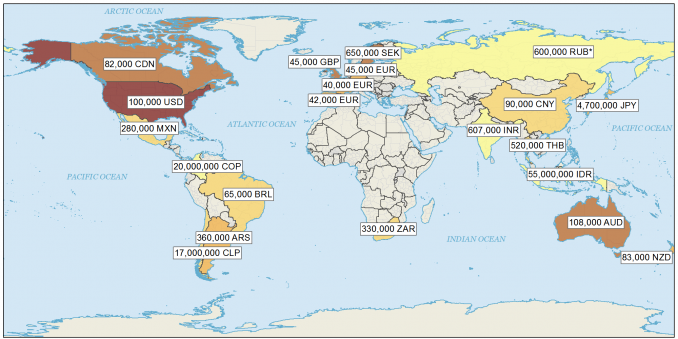 How do GIS manager salaries stack up around the world? In general, GIS managers are the highest level of pay you can earn in the field of GIS. What is the average GIS manager salary? In the map below, we show you how much GIS managers can make around the globe. Based on data from Indeed, here’s how much GIS managers salaries are in different currencies. GIS managers always have to do more in less time. They work on business development for long-term benefits and values of GIS in an organization. It takes years of experience to become a GIS manager. Not only do you manage GIS projects, but you manage the people who make the projects happen. Planting the GIS seeds in an organization means GIS managers are usually the beneficiaries of the highest pay. Even though GIS managers have a good overall basis of GIS, they don’t necessarily need the skills of a GIS technician or analyst. What are some of the daily tasks of a GIS manager? BUSINESS DEVELOPMENT involves anything from public speaking, technical writing & editing and budgeting. In addition, business management entails project management, teaching/training for personnel management and sales/marketing. CARTOGRAPHY is the study of creating maps. The origin comes from charta – “tablet or leaf of paper” and graph – “to draw”. Instead of creating map products, GIS managers often have to review maps. This includes anything from softcopy mapping, web mapping to ordinary map design. SPATIAL ANALYSIS uses techniques to manipulate, extract, locate and analyze geographic data. For example, spatial analysis examples include buffering, clipping and exploring the relationships between map feature. GIS managers will have to provide input for GIS modeling, data integration & conversion, data analysis and geomatics. What is the typical job description for a GIS manager? Manage a diverse GIS project portfolio, guiding project decisions regarding technical approach, cost implications, and project scheduling. What are your GIS salary expectations? We give a glimpse of what to expect in a GIS career and how far you can move up the GIS job pyramid. The role of GIS technician seems to indicate a lot of digitization, putting together maps, collecting data, basic maintenance of data.